Dan's Adventures in Fiction: One-Oh-Oh - and a giveaway! One-Oh-Oh - and a giveaway! Ta-da! 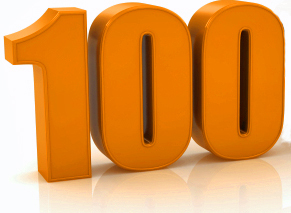 Here it is - my 100th blog post. I must admit, I was quite surprised when I noticed a couple of weeks ago that my blog counter had crept into the high nineties. It's taken about two years to get to this point, as I only post once a week or so. I thought it was worth marking the occasion. And I thought a good way of doing that would be with the time-honoured tradition of a giveaway. Whoo! 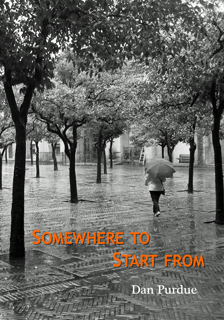 Up for grabs is a copy of my anthology, Somewhere to Start From. Just leave a comment below or - if the anti-spam controls here defeat you - you can leave a comment on my author page on Facebook. If neither of those options are any good, you might need to resort to carrier pigeon or something, sorry. At the end of November I'll put all the names into a hat (quite possibly a Christmas hat) and pick a winner at random. Then I'll post the book to whoever that might be, wherever they are in the world. I'll happily sign, dedicate, or otherwise scrawl on the book, or leave it pristine, whatever he or she would prefer. Somewhere to Start From is a collection of 21 short stories, ranging from stories with a handful of words (I think the shortest is 27 words), up to much more substantial pieces. The collection represents the best of my "early work", in terms of stories that did well in competitions and those that were published in print or online during my first five or six years of writing fiction. There are a couple of unpublished stories in there too, although the majority of them have earned their stripes out in the big wide world. Since I put it together, the book's been well-received, attracting some very favourable comments on Amazon and elsewhere. It's a tricky collection to promote in some ways - although it has sold (and is for sale) in bookshops, notably the Press Shop in St Peter Port in Guernsey, and Books & Ink in Banbury, and has sold online too. Being both self-published and an admittedly random collection of short stories, it's hard to get past the assumption that it's yet another badly edited vanity project, and it's almost impossible to answer the dreaded question, "What's it about, then?" One theme that pops up in many of the stories is a character trying to find their place in the world. Sometimes this is because the world they knew has changed beyond recognition; sometimes this is because they've never quite been able to understand the world in the first place. In Changeover Day, the first story in the collection, god prepares to make way for his replacement, and ponders what will become of both himself and his beloved dinosaurs. In Secondplace, a travelling salesman realises the sacrifices he has made for his career have left him stranded in a bleak no man's land. In A Night In with Zil, King Kong and his flatmate Godzilla try to keep a low profile while the outside world won't let them forget their violent pasts. Elsewhere, there are stories of redemption, revenge, and unrequited love. Relationships fail, new ones are kindled, existing ones shift and change. There are stories about gods, monsters, angels, robots, hellish hotels, body-builders and body-snatchers. There are ordinary people just doing whatever they can to get by. There is a daring heist on a jewellery store masterminded by a talking magpie, a tale of adventure on the not-so high seas, and a restaurant review that's almost - but perhaps not quite - outlandish enough to be real. Who'd want to read it? I believe the mix of stories, genres, and styles mean most of the book will appeal to most readers. If you absolutely cannot stand short stories, or you only like bleak, humourless prose about beaten-down characters spiralling their way to an early grave, it might be best to give this a miss. But if you're open-minded, appreciate a skewed take on life, and enjoy not really knowing what's coming next, this could be just what you're looking for. From a writer's point of view, it offers an insight into the kinds of stories and ideas that catch judges' and editors' eyes, as many of these tales have won prizes or been published in places like Writers' Forum, or The Guardian website. I totted up the prize money and publication fees and the book has a theoretical worth of £396 - which means the cover price represents extremely good value for money. You can see where some of the stories ended up by going to Amazon and having a 'Look Inside!' at the contents page. It's (obviously) not a how-to book, but if you're entering the same kinds of competitions, you might pick up some tips or inspiration. Or you can just sit there and seethe, thinking, The story I submitted was much better than this rubbish. Whatever floats your boat. So, if you like the sound of the book, or if you already have a copy and would like to win another for a friend or relation (hey, Christmas is just around the corner, after all), just leave a comment here, or on Facebook, and don't forget to check back after 30th November to see if you've been picked. Congrats on the 100th post. Sounds like a great collection. Liking the blog. Well done on reaching the 100 mark. Happy blogpost centenary! You should get a telegram from the Queen :) The collection looks fab. Please put me in your Xmas hat! Really enjoyed 'Spontaneous human Combustion' so I'd like to see more. I'm thinking of producing an e-anthology of my own short stories that have had previous competition success. So I'd really love to read yours and see if I can pick up any tips on putting a collection together(maybe Somewhere to Start From could be a 'how-to' book despite what you say!). That's weird! I thought I'd commented two days ago! Oh well, must have pressed the wrong key. Congrats on the 100, Dan. I like the sound of the book but I love the title! Well done reaching the 100. This sounds really fascinating especially given that I have been picking up Writer's Forum for some time now but have yet to enter one of their competitions! I've mentioned it on my blog, Dan. Hi Dan, I'm new here, Patsy let me in through the back door...Congratulations on your 100th post. I can identify with the theme of your book, the world is certainly a different place these days, and fiction is all the more important don't you think? I love the escapism, of both reading and writing. Thank you, everyone, for commenting. It's great to see some new names here and I'm very pleased to hear people are interested in the book. Congrats on the 100th post, Dan. Congratulations on your 100th blog post! I know I'm too late for the draw but I enjoyed reading your post and I like the sound of your anthology so looking forward to reading the stories too.